Except when we eat, our teeth should not be in contact. When we tend to keep our jaws clenched for long periods of time, whether it is day or night, we have a problem with clenching our teeth. If, in addition, the jaw moves back and forth while maintaining a clamping force, it is called a tooth creaking. 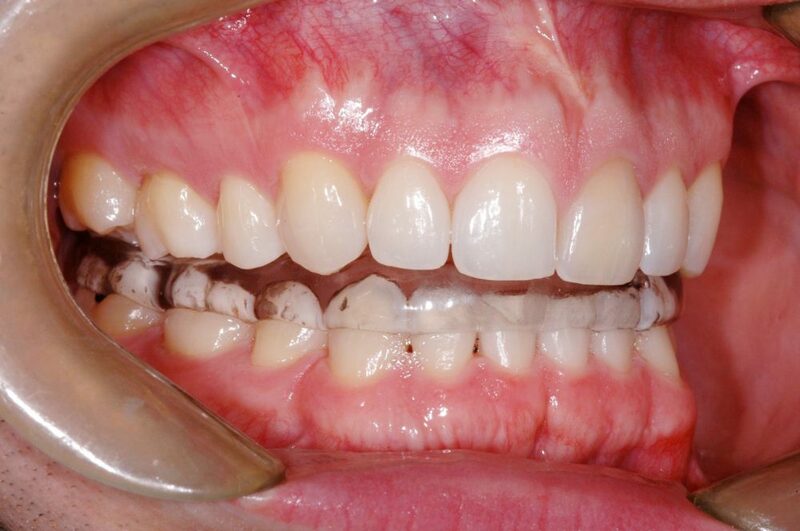 This form of tightening causes a lot of wear on the teeth. When squeaking occurs at night, the forces can be very high. Teeth grinding can also have harmful effects on gums, chewing muscles and jaw joints. The characteristic sound produced by teeth grinding comes from a lateral or forward and backward friction movement of the teeth. In this case, i. e. when the lower jaw moves, we speak of dynamic bruxism. A majority of people who have already heard a teeth grinding consider the sound emitted as simply awful, irritating and unforgettable! People who clench their teeth without making them grind emit little or no sound, because the movement involved in clenching is a vertical pressure exerted on the teeth by the force of the jaws without lateral movement of the mandible; this is called static bruxism. A person can therefore suffer from bruxism without making any noise. In theory, teeth should never touch each other, except for the 20 minutes combined daily during which a person chews or swallows. However, the situation is very different for part of the population. A large part of the population will suffer from bruxism at least once in their lives; for some, bruxism will become a chronic disorder. Almost as many children (14%) as adults and the elderly (11%), both women and men, are affected on a regular basis, i.e. several times a week. Bruxism tends to decrease with age according to studies conducted on this subject, with the maximum number of cases being recorded in individuals aged between 20 and 50 years. Bruxism is considered by many researchers as a sleeping sickness in its own right. It can potentially cause other disorders, ranging from snoring to sleep apnea (breathing stops during sleep). Some even attribute bruxism to problems of concentration, both for adults and children, and to learning problems in school among young people. Chronic burners have a disease that tends to get worse over time. Indeed, the more an individual clenches or grinds his teeth, the more his chewing muscles will tend to tighten. An increase in the tightness of these muscles can result in a greater squeeze or creaking, leading the person into a vicious circle from which it is very difficult to escape. 80% of addicts are active at night (nocturnal bruxism), while the other 20% burn during the day (daytime bruxism). The main difference between the two types of bruxism is the awareness of the gesture. Daytime bruxomaniacs have some control over the movements of their jaws (voluntary movement). They can therefore more easily get rid of their habit by identifying the cause of their bruxism and trying to release their jaws when they become aware of the action in order to avoid sequelae. Conversely, nocturnal bruxomaniacs grind or clench their teeth completely involuntarily, often during periods of light sleep, while body movements, especially those of the lower jaw, are more frequent. The pressure exerted on the teeth of nocturnal burners is also higher than that exerted by daytime burners. Usually, neither the squeaking noise nor the pressure exerted wakes the nocturnal bruxomaniac. Young children, who still have their primary teeth, are also affected by bruxism. They may grind or clench their teeth during the day; these movements are usually motivated by a desire to discover their new teeth. However, they may also seek relief from tooth growth, which leads them to clench teeth to exert counter-pressure on the gums or erupting teeth. Young children can also grind or clench their teeth unintentionally at night for various causes. At the evolutionary level, it is now believed that bruxism allows young children to slowly get rid of their primary teeth. Bruxism usually stops spontaneously in children when their permanent teeth appear in the mouth. On the other hand, parents of a young chronic bruxism sufferer should monitor their sleeping habits, as a bruxism sufferer child is more likely to maintain this habit in adulthood if the cause is not treated at the outset. The most obvious symptom of bruxism is the appearance of intense frictional noises from a sleeping person who is experiencing bruxism. However, it is an indirect symptom, as long as these noises are heard by a third person, and the person suffering from bruxism is not the one who can detect them. Fatigue when you wake up, despite the number of hours of sleep. The most common causes seem to be psychosocial problems, which are experienced during the day and manifest themselves through stress, anxiety, competitiveness or hyperactivity. It may seem surprising that problems that occur during the waking period can have an impact on nocturnal behaviour. However, it seems that this is due to poor stress management or higher than average stress levels. Moreover, one of the manifestations of the stress experienced during the day is precisely a clenching of teeth. It is therefore not surprising that this involuntary movement continues into the night, when the person is no longer aware of the tension affecting his or her jaws. One of the populations particularly affected by bruxism is students who, during their exam periods, experience a higher than normal level of stress. Researchers agree that a genetic component may also explain some of the cases of nocturnal bruxism. It is thought that a disorder in the cerebellum (autonomic nervous system) is the cause of this type of bruxism. On the other hand, genetics would not be a factor in daytime bruxism. Stress or extreme concentration when performing a task are the most likely causes of the phenomenon. Most people who grind their teeth sleep on their backs. This position allows the mandible to move backwards and the tongue to move towards the bottom of the mouth more easily. This reduces the amount of air going to the lungs, causing a decrease in oxygenation, which can lead to bruxism. Similarly, people who adopt oral breathing would also be at greater risk of burning at night. 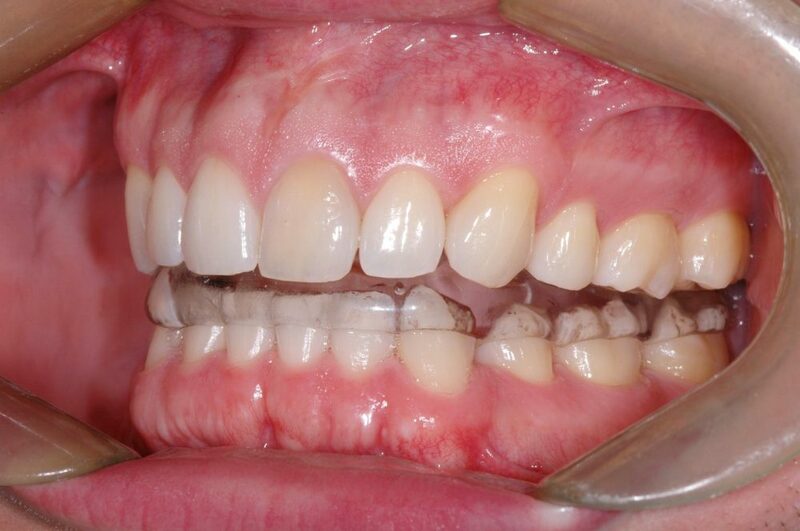 Individuals with misaligned teeth or significant malocclusion (gearing of the upper teeth with the lower teeth) are at greater risk of grinding or clenching the teeth and damaging them. The consequences of bruxism are often greater in these individuals. Trauma, whether cervical or joint, can contribute to bruxism in some individuals. These traumas can be caused by a whiplash, a car accident or multiple general anesthetics requiring intubations, which can negatively affect an individual’s temporomandibular joints (TMJs). Some drugs, such as antidepressants, as well as some drugs, such as ecstasy and THC, can increase the chances of suffering from bruxism because of their chemical actions and their effect on the brain. A majority of people suffering from bruxism think they can find the solution to their problem by seeking above all to relax and free themselves from the stress they have experienced. While stress can be an aggravating factor in tooth clenching, it is important to know that it is generally not the only cause of this common problem. Indeed, if the occlusion of the teeth is not adequate, i.e. if there is bad contact between the teeth, it can lead to a muscular reaction of clenching or grinding of the teeth. Your dentist can check with you to see if you have a malocclusion and suggest various ways to correct it or compensate for its effects. An ideal occlusion is to have all the teeth touching at the same time when you close your teeth by adopting a jaw posture that is as natural as possible (the one where it would like to go if the muscles could relax…) When you move forward or move the lower jaw laterally, only the front teeth should touch. If you feel your back teeth rubbing against each other a lot when you make certain jaw movements, it could be a sign of poor contact between the teeth. These contacts can cause your muscles to react (clenching or grinding your teeth). Many people have a malocclusion and have become accustomed, over time, to poor contact between their teeth. In a way, they are in balance in their imbalance. They may clench their teeth regularly, but may not realize too much that something is wrong. A small change such as replacing a filling or restoring a cracked tooth can change the way teeth close together and cause the reflex to clench or grind teeth. If a new repair is too thick, it can trigger the clenching or grinding reflex. Sometimes, a simple adjustment of this tooth will solve the problem. It is therefore advisable to consult your dentist if you notice that you start clenching teeth after having a job in your mouth. To correct a tightening problem due to malocclusion, occlusal plaque, orthodontic treatment, dental restoration work, occlusion balancing or a combination of these different approaches may be proposed. The help of therapists such as massage therapists, physiotherapists, chiropractors and osteopaths is also of great support. Some medications such as muscle relaxants or analgesics may be prescribed temporarily, but this approach should only be used in the short term. In the medium to long term, teeth grinding can have various consequences that are sometimes irreversible. These complications often occur because bruxism involves muscle forces far beyond those induced by chewing and swallowing. Moreover, bruxism does not always lead to harmful consequences; it all depends on the frequency of bruxism episodes and the muscular forces involved. In reality, it can therefore happen that a person who burns only affects his or her spouse with the sounds emitted by the grinding of his or her teeth. Most of the consequences described below are also symptoms of bruxism. All these symptoms and consequences should lead an individual to consult a dentist as soon as possible. When a dentist quickly takes charge of a burner, he or she can limit the damage before more serious problems occur. When tooth wear is very severe, damage to or necrosis of the dental nerve can occur, which can lead to the devitalization of worn teeth. Difficulties in yawning comfortably can occur and the bruxomane may feel that his mouth no longer opens as wide as before. The hypertrophy of the chewing muscles which, by dint of being solicited, develop abnormally. In other more complex situations, the problem will have to be considered in a more global perspective. For example, if a restoration is performed on a tooth that was in poor contact before being restored and the new restoration eliminates this bad contact, it may reveal the presence of bad contacts that were previously hidden. This explains why it sometimes happens that, as a result of work done in the mouth, a tooth that has not been touched becomes hypersensitive. There are not many ways to prevent a tightening or squeaking problem. Relaxation can be sought by practicing relaxation or yoga or by using massage therapy, osteopathy or chiropractic treatments. 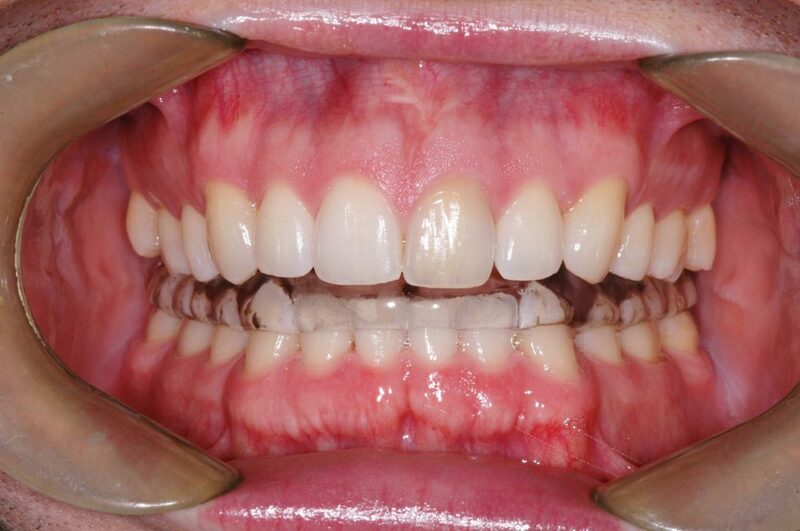 It is also important to understand that although these complementary approaches are very useful, the best solution is generally to combine them with appropriate dental care to remedy or correct the malocclusion. Otherwise, the tightening or squeaking may return sooner or later. It is important to know that the perceptible signs on the teeth, muscles and/or joint always precede the symptoms of pain. It is therefore in your best interest to act quickly if your dentist perceives the effects of clenching or grinding your teeth, even if you do not yet have pain… The most common signs observed on your teeth are loosening, mobility, wear, as well as the appearance of cracks or breaks. Symptoms range from hypersensitivity to certain teeth to headaches and muscle tension in the head and neck. It also happens that by clenching our teeth too hard, the jaw joint starts to make noise when the mouth is opened (a cracking or clicking sound) or that the chewing muscles become painful or develop a spasm. In the case where stress is potentially involved, the burner has different solutions to hopefully remedy the situation. Stress and anxiety can be managed and controlled with relaxation techniques such as yoga, meditation and also psychotherapy or hypnosis. These techniques involve an investment of time and sometimes money on the part of the burner, but they can remedy bruxism or, at the very least, reduce it in a sustainable way. Adopting a quiet, noiseless environment in the bedroom can help to minimize episodes of bruxism. Acupuncture can also be effective in countering stress and anxiety and can be of great help in the management of bruxism, both in children and adults. In order not to accustom the chewing muscles to being active outside meal and snack periods, it is advisable to avoid chewing objects that are not food (e. g. pencils, pens, straws, etc.) or chewing gum. Maintaining the action of chewing during the day can increase the need to clench your teeth at night. Stimulants can contribute to bruxism, hence the importance of not smoking before going to bed or consuming alcohol (beer, spirits, wine) or caffeine in all its forms (coffee, tea, energy drinks, soft drinks, chocolate, etc.) a few hours before going to bed. In cases where the cause of bruxism is not psychological, there are solutions to minimize its negative impacts, depending on whether the damage is already apparent or not. For example, stretching chewing muscles to relax them can help reduce the pressure when a burner clenches their teeth. When tooth wear is severe, an oral health professional can apply a varnish to the teeth to desensitize them and reduce the discomfort of the bruxomane. Fluorinated gels can also be applied by the burning patient as part of their home hygiene care. Drugs that regulate sleep are contraindicated to prevent bruxism. Indeed, various studies conclude that these are not really useful. However, some muscle relaxants can be used, as long as they are discussed with a doctor or pharmacist beforehand to avoid developing an addiction. For young children, the preferred approach to reducing bruxism is to introduce calming activities into their daily routine to reduce anxiety and hyperactivity. In some cases, it is possible for a child to wear a mouth guard. Custom-made joint plates are not recommended at an early age, as a child’s teeth are constantly changing.